Cammy Nguyen, sole owner of Blossom Beauty Lounge, has lived and breathed nails since she was 13 years old. With a manicurist for a mother, Nguyen grew up assisting at her aunt’s Torrance, Calif.-based salon and got licensed shortly after turning 18. 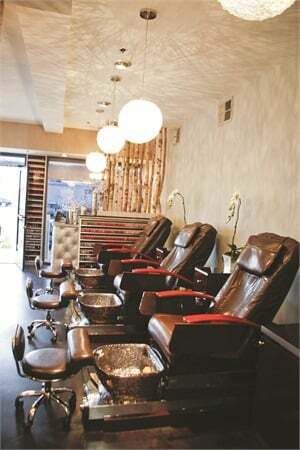 Blossom Beauty Longue opened in Redondo Beach, Calif., in April 2012 after Nguyen built a client base of her own in the South Bay of Los Angeles County, where she grew up. Being exposed to countless nail salons, Nguyen knew exactly what she wanted: to keep prices affordable while making major adjustments to the type of salon she knew from childhood. Nguyen put customer service at the top of the list, and then strengthened cleanliness and quality with top-notch products and education. Nguyen was adamant about being selective throughout the hiring process. “Nails are my commitment and I can only work with people who are as committed, professional, and on top of their game,” she says. Taking her time, she interviewed over 100 candidates. Before she found her current staff, her mother helped out; the two worked seven days a week. It took Nguyen two weeks to train her employees, and now every nail tech is booked solid. Nguyen wanted every tech to have the same skill level so customers feel comfortable with anyone. “I don’t do anything my girls don’t specialize in,” says Nguyen. Clients receive a telephone reminder before all appointments and nail techs are taught to pay close attention to detail. Staff members even stay past the salon’s 7 p.m. closing time, accommodating clients who work late. In addition to being customer-friendly and affordable, another sales tactic Nguyen has employed is featuring a menu that’s as straight-forward and simple as possible. For manicures and pedicures, there are three different treatment options: Blossom Mini ($20 mani/$30 pedi); Blossom Classic ($25/$35); and Blossom Ultimate ($35/$45). Mini is the basic service for on-the-go women, while the classic adds a hot towel treatment and hot oil massage to the package. “The Blossom Classic is my favorite because it’s all-inclusive and everything’s done in one hour,” she says. The Ultimate includes everything from the Classic but adds a soothing paraffin treatment. For gel-polish, clients simply tack on $20 for a mani and $30 for a pedi to the set price. Although Blossom Beauty Lounge offers a plethora of beauty services from permanent makeup to waxing and facials, its nail services are most popular. Currently, the majority of the salon’s clients are interested in gel nails and more specifically, gel nail art. The salon has over 700 polishes and around 500 gel-polishes to choose from, plus almost every color of glitter. Polish bottles arranged by color line the walls and what’s not on display is pulled out from drawers attached to the manicure stations. “I try to have every color on the market,” says Nguyen. Brands carried at Blossom include: Essie, OPI, SpaRitual, China Glaze, Hand & Nail Harmony, Light Elegance, Presto, and CND. According to Nguyen almost every Blossom client from age 16 to 80 requests nail art. What’s unique about the salon is that clients are charged a standard price of $5 per nail regardless of what type of design they’re getting done. Nguyen and her staff stay on top of their skills and knowledge by reading about nails frequently, attending local beauty shows, and watching nail educator tutorials. Nguyen conducts regular training sessions. 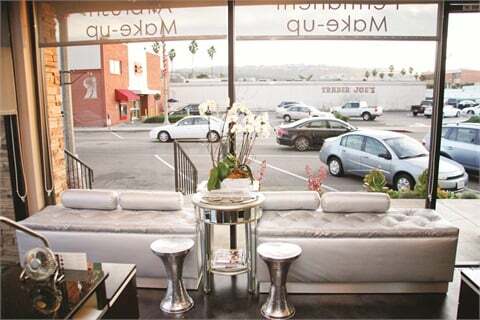 The salon’s decor, designed by Nguyen, is chic and modern with elements of glitz. Birch tree branches imported from Maine provide a serene backdrop for the earth-toned furniture and brown leather chairs. Contemporary chandeliers project light in strands, giving the tan walls texture. Z Gallerie accent pieces, such as silver stools and mosaic mirrors, in addition to bright white orchids, are a glamorous color pop as well. 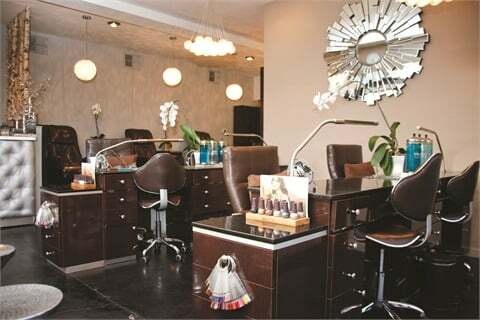 Inside the salon, everything looks exceedingly sleek and organized. 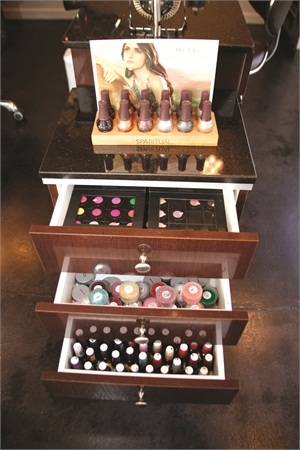 Custom-designed manicure and pedicure stations were built with ample storage space so every piece of equipment or tool has a home. Even the UV and LED curing lights are neatly tucked into a space directly underneath the surface of the table for clients to nonchalantly slip their hands into. Nguyen is a self-proclaimed “germaphobe” and therefore takes extra precautions when it comes to salon sanitation. New tools are taken out for every customer and each station has its own Barbicide jar. The pedicure tubs have individual liners and electronic devices that create movement in the water without the risk factors of a typical whirlpool. As of now, Nguyen is content expanding her salon slowly but hopes to eventually occupy the available 1,200-sq.-ft. space next door.